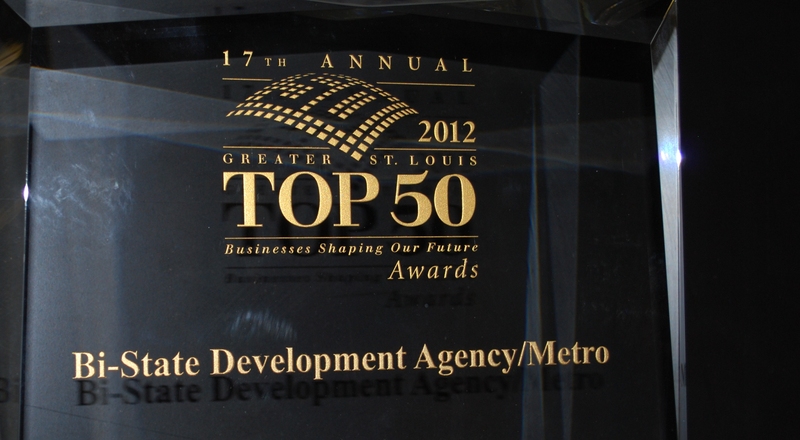 Bi-State Development Agency which has been operating as Metro since 2003 is the proud recipient of one of the Greater St. Louis Top 50 Businesses Shaping Our Future Awards presented this week by the St. Louis Regional Chamber & Growth Association (RCGA) in conjunction with RubinBrown. Metro and 49 companies were selected for their significant contributions to the St. Louis region. Metro is invested in the Bi-State area and works across county and state lines to promote economic development throughout the region. We were established in 1949 by Congress through a compact between the State of Illinois and the State of Missouri. The Agency’s mission was, and continues to be, to drive economic development. Metro has served as a regional problem solver for more than six decades and we continue that mission in many areas including aviation, tourism and public transit. Bus companies in St. Louis had two things in common in the early 1960’s – they were owned by for-profit companies and they were all going broke. Reliable public transit is vital to businesses, customers and employees; as well as to schools preparing students for a brighter future. Conventions, tourists and new businesses are attracted to cities with strong public transportation. The failing transit companies Bi-State took over in 1963 now include a MetroLink light rail system, MetroBus and Metro Call-A-Ride. In the last fiscal year, citizens used Metro Transit 47 million times to get to work, to school and to other important destinations. The transit system has also gained international acclaim and ranks among the best in the nation for on-time performance, vehicle reliability and safety. The Bi-State Development Agency reopened the shuttered Parks Metropolitan Airport in the Cahokia/Sauget area of Illinois in 1965. Renamed the St. Louis Downtown Airport, the airport is now the third busiest airport in the State of Illinois with more than 120,000 planes flying in and out each year. The airport recently expanded its ability to attract even more business by extending the primary runway and upgrading fire and rescue capabilities. A new study conducted by the Illinois Department of Transportation Division of Aeronautics indicates that the airport and its surrounding industrial business park contribute $583.9 million to the local economy. When the Gateway Arch was being built, the Bi-State Development Agency was asked to solve another problem. There was no funding left to purchase, install or operate the trams to take visitors to the top of the structure which would go on become St. Louis’ iconic landmark. The Agency issued bonds to purchase the trams and since then we have been running much of the retail operation of the Gateway Arch as well as the cars which have taken millions of people to the top. The Agency also issued bonds to provide parking for Arch visitors and continues to operate that parking facility today. The Agency also supports regional tourism by owning and/or operating other popular Riverfront attractions that have revitalized the area around the Gateway Arch such as excursions on the Gateway Riverboats and helicopter rides. Metro is honored to be recognized by the RCGA and commits to helping the region prosper for decades to come.